Google announces Android Oreo with refined notifications, better battery life, updated emojis and ‘the biggest change to the foundations of Android to date’. Google has opened the packet on version 8.0 of its Android operating system for mobile devices. Oreo succeeds Nougat and Marshmallow, and follows a long-line of candy-themed Android releases. Timed to coincide with the passing solar eclipse in the US – and prior to the announcement of the next raft of Android smartphones from the likes of Samsung and Sony – Oreo brings dozens of enhancements to Google’s mobile experience, yet those expecting a cookie jar filled with colourful new features may be disappointed. Nevertheless, under the covers is what Google calls ‘the biggest change to the foundations of Android to date’, promising more users will be able to enjoy Oreo sooner, safer and for longer. In-app autofill: already a common feature in web browsers, logins to popular apps can now be automatically populated too. Notifications: Discrete dots appear on the corner of app icons to reveal the presence of a notification from that app. A long/force press on the icon reveals actionable notifications. Long overdue. Also new is notification snoozing and notification categories. Picture-in-picture: continue watching a YouTube video while checking email, or check your calendar while on a video chat. Background limits attempt to hobble battery hogs by imposing restrictions on infrequently used apps. Emoji makeover: over 60 new emoji, with many more redesigned to look more like other platforms’ implementations. Bye bye, blobs. 2 x boot speed: anything that improves time-to-productivity must be good, but given that most of us tend simply to lock our phones between uses rather than switch them off, the benefit here is minor. Smart copy and paste attempts to bring a little more intelligence to the traditionally tricky activity, selecting entire addresses or phone number and suggesting appropriate activities for selected text such as calling, emailing or opening a map. Google has submitted Android Oreo to mobile networks and manufacturers for certification and testing. At this point, it’s up to them when they choose to push Oreo out via an over the air (OTA) update. Many hope it will be soon, but history might suggest patience is required. However, Google hopes its new modular architecture, also delivered in Oreo may speed this process. Project Treble, announced prior to the Google I/O developer conference this year, attempts to make rolling out Android easier, faster and less costly. A new ‘vendor interface’ now sits between the device-specific vendor implementation code and the Android OS framework code, reducing the amount of code that needs to be reworked when a device is updated to a new version of Android. It’s a great idea in theory, but time will tell how much of a real-world difference the change makes to the speed at which existing handsets get shiny new Android releases. 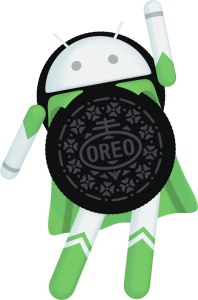 However, eager beavers hungry for some next-gen Android action can precipitate their Oreo feast by registering their handsets with the Android O Beta programme. Visit the Beta portal, sign in with the Google account to which your compatible handset is registered, agree to the conditions and you’re good to go. Google’s own pixel phone is one of a handful of devices that are ready to roll with Oreo right now. Within a couple of minutes of registering our Google Pixel XL, the System Updates menu revealed that the Oreo 8.0.0 release was ready to install.